Wendell Berry, the American farmer, writer and thinker, famously said that “Eating is an agricultural act”. The quote now has a life of its own, but it is worth remembering that Berry used it to introduce a longer version of his advice to the urban consumer who wants to know what they can do. The short version is “eat responsibly”. To do that, though, you have to understand how agriculture and the food we eat are connected, how they form part of an entire system. My guest on this episode understands more than most people about how the various parts of the food system fit together, and it is a lot more complex than many people can imagine. For a start, take the label on the apple in the image on the left. In case you cannot read it, it says: “Forget organic. Eat local.” Nice, simple advice. But more or less pointless. There’s so much more to food systems than just the distance the food travels. Tim Lang – who coined the phrase food miles – agrees. When he visited Rome recently for a conference on sustainable food I took the opportunity to get together to chat about the complexities of food systems. Our conversation ranged from high-level government policy to what you do with the skin of a mango you’ve just eaten, the point being that once you start to look at food systems as a whole, those two aspects of how we eat become closely intertwined. Gareth Edward-Jones’ paper Does eating local food reduce the environmental impact of food production and enhance consumer health? is a good introduction to some of the difficulties with a simple view of food miles. Tim mentioned the work of Carlos Monteiro, of the University of Sao Paolo, on ultra-processed food, and Barry Popkin, of the University of North Carolina, on the nutrition transition. That quote of Wendell Berry’s is a pithy soundbite, but the whole essay The pleasures of eating is well worth your time. And if you fancy a really deep dive into recent thinking on some aspects of food systems, how about this report from the European Commission: Energy use in the EU food sector: State of play and opportunities for improvement. Banner photo by Duncan Brown. “Forget organic. 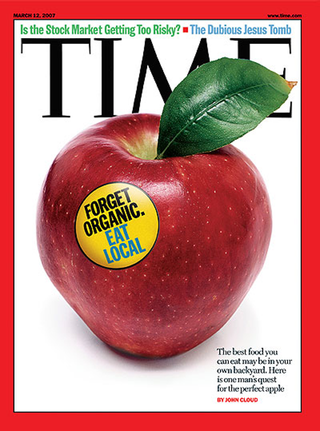 Eat local.” Nice, simple advice, from the cover of Time magazine. But more or less pointless. There’s so much more to food systems than just the distance the food travels. Tim Lang coined the phrase food miles. We talked about the complexities of the food system.